As Halloween approaches, you may be among the many who welcome trick-or-treaters with seasonally appropriate outdoor decorations. It’s easy to forget the damage these pieces can do to your yard. Not to mention the feet of all those visitors — ghosts and witches may be able to fly, but other creatures of the night can tear up your turf even when you don’t choose “trick.” A little thinking ahead can spare both you and your lawn a lot of stress. Have a Strategy: Once you start thinking about this problem, a bunch of ideas you’ve never considered before will start to seem obvious. 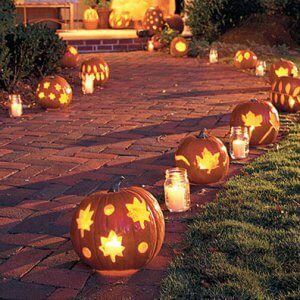 – Use festive stakes, jack-o-lanterns, or other light sources to create borders around your lawn. Clear leaves and debris from walkways to create an obvious path for foot traffic away from vulnerable grass. – It’s easy to assume larger decorations as “centerpieces” should be placed in prominent locations for maximum impact. This way of thinking naturally suggests the lawn. Instead, arrange the main features to draw attention to the exterior of your house, especially the front door. – Larger decorations can also be placed on the driveway or mulched beds. – What to do with that empty space? Add scope and depth to your display by hanging items from trees. The shelves of your local party store and Walmart are buckling under the weight of numberless options, from balloons and glow sticks to scary beasties of every description. The most important trait to bear in mind is weight, so your trees survive the night intact as well. Decoration Management: Inflatables can create sizable patches of dead grass. As we mentioned above, it’s easy to place them on mulch, concrete, or a porch or patio. If you must display them on grass, consider setting them out in the early evening on the designated day of trick-or-treating and taking them down before turning in for the night. Frightening Fruit: Fortunately, one of the major symbols of the holiday is both in plentiful supply and completely natural. We’re all familiar with the tradition of carving pumpkins into menacing jack o’lanterns, with the innards set aside for cookies, muffins, breads, and pies. But they can also be painted with an infinite variety of colors and designs, and arranged with other organic elements like black monkey grass and black pansies. They can be incorporated into a border, as we mentioned above, or placed wherever they’re most unnerving. You might also frame a door or window with pumpkin topiaries. Pumpkins’ relatively small size means that the amount of grass they can endanger is limited. As a bonus, they are 100% biodegradable and quickly break down into (unpleasant-smelling) fertilizer. It can be fun to dream up expansive Halloween scenes — it’s certainly fun to look at them — but it’s easy to forget the threat they can pose to carefully cultivated turf. Adopting a different strategy can not only save you the trouble of repairing unsightly damage to your grass, but also set your home apart from those decorated in more traditional ways. We hope you and your lawn enjoy the holiday!